Carry your must-have makeup, brushes, tools, toiletries, and more wherever you roam! This handy folding wrap with strap closure and coordinating zippered bag make it ieasy to store and oranize all your essentials in style. 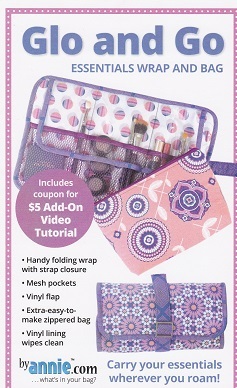 Iron-on vinyl interfacing makes an easy-to-clean lining for the wrap and bag. Mesh pockets provide visible storage and expand for vulky items. A clear vinyl flap at the top of the wrap keeps everthing safe, secure and clean.